As you and million other brands and businesses are aware, the Super Bowl is a huge marketing opportunity. Today we’ll discuss your Super Bowl Hashtags for Instagram and how to use them, but before we do, you need to click thru and read why you need to be careful when marketing on Social Media during the Super Bowl. In short, the NFL has some pretty strict rules on how businesses and brands use the term “Super Bowl” and other associated terms that can land you in legal hot water. After you’ve read that article and worked out a legal Super Bowl Instagram strategy, go ahead and click “copy” to copy these hashtags and store them on your smartphone so you can use them as needed during the time before the big game. Then, read on for some great ideas on how to use these hashtags to market your business during the big football game that happens each year, the first Sunday in February (Feb 3). The hashtags you copied above are generalized hashtags for the game. When you post, you need to supplement these with other hashtags that will help you get visibility from the audience that is related to your brand or business. The reason for this is that hashtags are to Instagram what keywords are to Google. 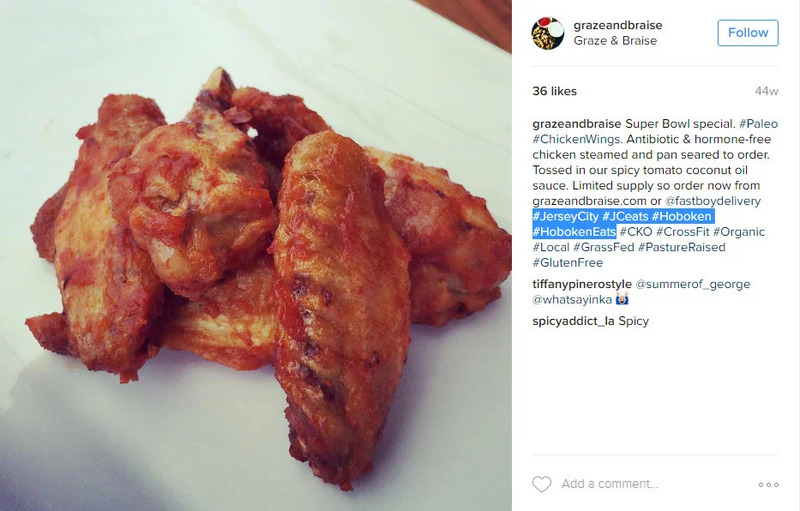 Hashtags will help you get found, so – for example, if you are a restaurant pushing a wing deal for the event and you skip out on geo-targeted hashtags, you may get a lot of likes, but not from people who may actually come to your restaurant. PRO TIP “Some sites and blogs will tell you to use just few hashtags. We disagree 100%. Instagram allows you to use 30 hashtags. USE THEM! They are what will help you get found. As briefly mentioned above, the hashtags we gave you are optimized, but they are general. You want to utilize these so that your Instagram posts are tied to the Super Bowl, but you need to narrow things down. This is especially important if you are a local business such as a bar or restaurant, a sports shop, or even a taxi service (huge opportunities here if you run promotions to deter drunk driving). If you were a local business in say Hoboken, NJ, you should incorporate hashtags such as #Hoboken #NJ (your city & state) as well as nicknames for the city #TheMileSquareCity, and cities nearby #JerseyCity. On top of this, make sure you geo-tag your post so you come up on location search as well. There must be other brands or businesses that are related to yours. If their brand is good, you can piggyback off their reputation (and reach their audience). Take the example above. This donut shop in Toronto used Great Lakes Beer in their donut recipe. They didn’t just tag the picture with the associated brand (#greatlakesbrewery #greatlakesbrewing), they @tagged the brand. This meant that if they had not already made the brewery aware of the post, they would get a notification. 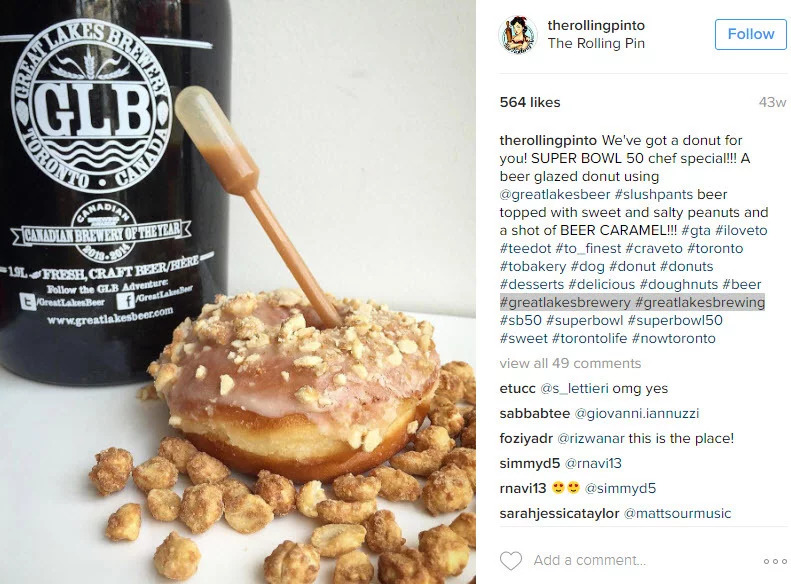 If they have a smart community manager, the brewery would like and comment on the post (creating engagement and helping the Donut shop come up higher on search), and if the brewery was really smart, they would repost you giving The Rolling Pin even more exposure. You’re prepared now. We’ve given you a list of optimized Super Bowl hashtags, we’ve explained how you need to use them and what other hashtags to combine them with (and you’ve discussed what you can and cannot do with your legal team)…but it takes more than just the right hashtags to achieve an Instagram touchdown. If you’re posting your Super Bowl post, but you haven’t been consistently posting, you won’t have an audience to attract, this means that you’ll just be hoping that the Instagram hashtags do all the work for you. This is not a smart strategy. Here are a few things you need to do daily (and Socialdraft can help you with this – just click play on the video above). If you can’t post daily, try to post at least 3-4 times per week. Multiple studies have shown that if you aren’t consistent on Instagram your audience will forget about you. On top of that, Instagram has implemented a Facebook-like algorithm. If you’re not active and you’re not getting engagement, your chances of coming up higher on the feed drop. Use an Instagram scheduling tool like the Socialdraft social media calendar tool to schedule your posts so you don’t miss a beat. On a daily basis, spend a minimum of 15 minutes engaging people. Start by liking and commenting on posts of those who liked your content, then click through to your industry hashtags and engage the people creating content around your industry. Lastly, follow people who create content about your hashtags. They will most likely follow you back, giving you a chance to engage and convert them.